At AMO Pharma, we understand what it means to have a loved one who is living with a debilitating disease. You want answers and you hope for effective treatments that can make a difference for someone you care about. Our mission is to bring those treatments to the patients and families who need them. Through our passion and our dedication to improving the lives of people who suffer from serious rare diseases, we also recognize the impact that these diseases have on caregivers and family members. Our goal is to ease the burden of disease for patients and for all of the people who support them and care about them. Our programs currently focus on debilitating neuromuscular and CNS symptoms of several especially challenging and complex rare diseases. In these efforts we collaborate with leading medical researchers, clinicians, patient advocates and caregivers, government policymakers and regulators from around the world, to ensure that their voices and perspectives can inform and guide our efforts. We feel that these contributions are essential in the pursuit of new medicines that can reduce disease burden and improve patient health and quality of life. As we move forward, we reaffirm our commitment to listening carefully to your perspectives as they will help to inform our work. We recognize that we are in this important effort together to make a positive difference for our families and yours. 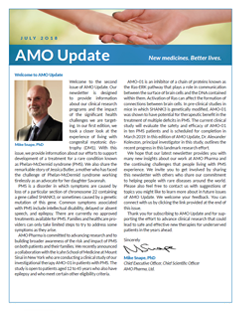 To sign up for additional communication with AMO, please click here. For background and clinical trial information for Phelan-McDermid syndrome, please click here. For background and clinical trial information for congenital myotonic dystrophy, please click here. 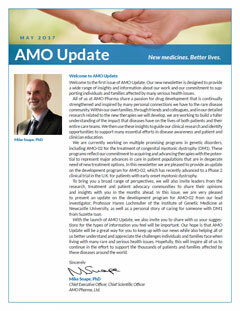 For information on AMO's compassionate use policy, please click here. © AMO Pharma All rights reserved.